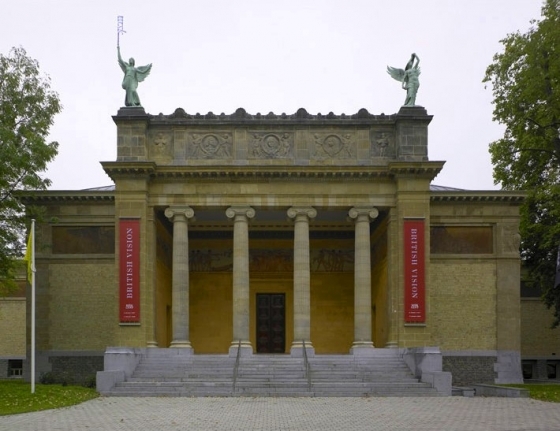 The Museum of Fine Arts Ghent possesses a large collection of sculptures, drawings and prints of George Minne. Most of these have been purchased over the course of the years. Between 1914 and 1951, it acquired fourteen works, of which four, acquired by legate or gift: Head of a Man from ca. 1910, acquired from the legate Scribe in 1913, the only existing plaster version of John the Baptist from 1895, gifted by Jean Delvin, a bronze version of the Kneeling Youth from 1898, gifted by The work of the War fund, both acquired in 1921, and the Small Injured Figure from 1898, gifted in 1950 by the artist and student of Emile Claus, Anna De Weert. What is noteworthy is that the purchasing policy before 1982 is primarily witness to circumspection, both with regards to the choice of the works as the number of them. The purchase in 1949 from the collection of Burthoul of the some 400 charcoal drawings, coming from Wales during the period of World War I, is an exception of this. From the same collection the museum acquired that year Man Grieving over a Dead Deer from 1896. The majority of sculptures that the museum purchased are bronze versions, with the exception of the Small Figure Kneeling from 1896, executed in marble, the wood sculpture The Bricklayer and John the Baptist, a replica of the plaster sculpture from 1895 that Minne had made in bluestone. The museum purchased the bluestone version directly from the artist in 1931. The exhibition George Minne and the art around 1900 signified an important step towards a directed purchase and acquisition policy by the museum. In that year, the MSK acquired four sculptures and three sketchbooks from Minne by gifts and purchases by the artist's family: the early plaster sculpture Men Fighting from ca. 1886, three sketchbooks from the period 1891-1898, The Prodigal Son from 1896 and the only preserved plaster version of the Fountain with the Kneeling Youths. For the occasion of the exhibition the MSK moreover acquired Man and Woman Kneeling from 1889 by the consignment of the Design Museum. That year, the Museum also purchased the first model for the Rodenbach Memorial from 1899, coming from the collection of Karel Van de Woestijne. In particular, the acquisition of the Fountain of the Kneeling Youths signified for the museum an exceptional purchase. From that year onwards, the museum strove to strengthen the George Minne collection with both sculptures as well as works on paper. In this capacity the museum sought to procure in the first place sculptures, drawings, prints and books from the period before 1900, the period in which the artist created his most original works. Thus is the museum committed from 1984 until the present day to complement the Minne collection with a few sculptural top pieces such as the Man with a Waterskin in 1986, Mother Grieving over her Dead Child from 1886 in 1996 and the like-named terracotta study from a year later. The most recent acquisitions date from 2011: Kneeling Youth from 1898, and Nun Praying from 1894. In addition, the museum bought a few exceptional pencil drawings such as Mourning Mother from 1890, provenance of the former collection of Grégoire Le Roy and bought in 1985, and in 2007 The Outcasts from 1898. In the course of the last two decades the museum also acquired the complete graphic work of Minne: four books by Maeterlinck, a bundle of poetry from Grégoire Le Roy and one by Emile Verhaeren, all with illustrations by the artist and the only known stand-alone print by Minne, the zincograph The Baptism of Christ from 1899, purchased in 1987. With regards to the purchase of the sculptures of Minne, the museum not only showed a preference for works from the early period, but also for plaster versions, a material in which the pure and powerful line of Minne's form and the subtle expression best come to fore from that.